hawn Silver is a professional Irish dancer and dance teacher in St. John's, Newfoundland & Labrador. He received master dance training in Dublin, Ireland with world champion dancers Ronan McCormack TCRG, Roisin Cahalane TCRG and Gemma Carney TCRG, all members of the famed Riverdance Troupe, and Margaret Kelly TCRG ADCRG who instructed Shawn in the Ceili (or group) dances (sponsored by the Governments of Canada and Newfoundland & Labrador). Shawn has worked in Canadian dance, film, music video, television and stage productions on a full and part time basis since 1982. These activities include: dancing, dance instruction and choreography, acting, location and set design. He has also worked as a model for a variety of print and television advertising campaigns. Born and raised in St. John's, Newfoundland Shawn was educated in Montreal in the 1980's and worked in Toronto in the 1990's, before returning to St. John's in 1998. 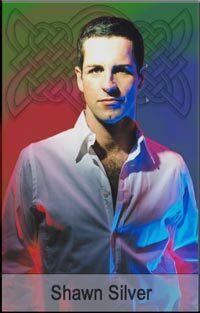 Some of Shawn's notable career highlights include: choreography and dance performance with the popular East Coast Celtic rock group The Fables for the 2002 Juno Awards Premier's Gala (honouring the best in Canada's recording industry); choreography and dance performance in Cape Breton Gaelic singer Mary Jane Lamond's award winning Stepping Song video (nominated for an East Coast Music Award 1998); research and feature interviews for The Stowaway, a 1999 History Channel documentary exploring his family's Portuguese heritage and immigration to Canada; location work for Ekhaya! (Freedom), a CBC-TV dramatic mini-series exploring the Canadian connection to apartheid, filmed on location in Toronto and South Africa; Production coordinator, choreographer and stylist for Bloomsday Cabaret , a film about James Joyce and music, shot in Dublin and St. John's; Acting roles in Canadian films such as The Ocean Ranger Disaster (2001) and Baking Lessons (2001).